I just couldn't risk damaging the flower spike of this Aechmea Cylindrata (Or is it just a large form of Gamosepala?) with those lows of 22 degrees, and it makes a wonderful indoor diversion to keep me in from the cold. If you look closely there are three droplets of nectar at the tip of every blue flower, and I can attest that it tastes pretty darn yummy. Double bonus! It is nice to know you and looking forward to seeing your garden progress. I like bromeliad! I have only one Guzmania and one Crypthantus. They are easy to take care. Your collection is admirable. 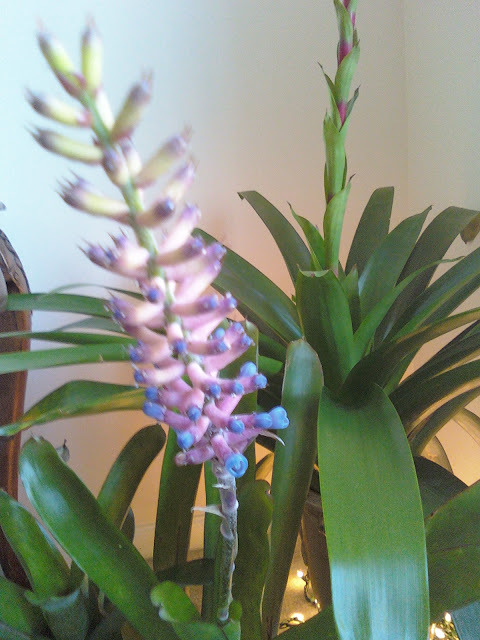 I like this blue flower spike. The bottom of the flower spike looks like a Gamsepala to me. Beautiful bloom spike! I love aechmeas! (if indeed that's what it is) My favs are neos for the colorful leaves, but I do have some aechmeas as well. 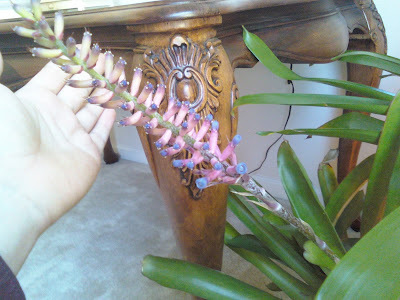 They have the most amazing inflorescences. Well, at least, I DID have some aechmeas before last night. A newer one spent the night in the house, but all my other broms are planted in the ground, so they stayed put. Hope they were cold-tolerant. I love your flower spike! Absolutely gorgeous! Thank the Lord you were able to bring it inside! I only have a few broms and want to add more to my landscape this year. Yours are beautiful! It may have done okay outside, but I am ironically even more protective of my most cold tolerant varieties it seems! Sanddune, do you happen to know if its still a gamosepala even though its huge? It was laveled Aechmea Gamosepala (Large form) but I've never found any info on such a drastically large variation. Floridagirl, be sure to take pictures of how your broms did! Thanks everyone! RFG...I'm sure I'll be taking more pics of the broms soon, as they are so photogenic, I can't resist. Some are still covered today, as we have another freeze warning tonight. (Last one for a while, I hope.) I'm only paranoid about the ones in exposed locations, since I lost two last year. It wasn't a huge loss, because I had several of the same species in shade as well, but it made me realize the danger.